Hello mates, I want to bring up to the Community and the Ypp staff, The Developers, Creator and everyone else above Ocean Master'ing' the issue with Custom Historical renames and how unfair and apparently selfish the system is working on them. For the past few weeks i have been Emailing, petitioning,/telling and researching about these renaming issues. I have been trying and some other fellow pirates, To get vessels to be renamed with the use of the Abreviation USS (USS : United States Ship,naval USA abbreviation) The word USS is an Invalid name but it can be worked with using the exception Historical vessels as stated on the rules. Now almost the majority of these USS names have been denied by prometheus, which from how it looks like is the one in charge of the renaming department because every single rename i have submitted under this criteria for some reason has to go trough him.And Been denied over and over, Even when i have followed the rules from top to bottom. Now making a little parentesis and renaming my good buddy USS, The name H M S has been used in many ships, Many of these HMS ships, which btw in my crew there are 5 of them, Many dont even fit the criteria have been approved, many pirates saying most of the HMS renames have been taken atm. Now , Im questioning, How can HMS, (Her Majesty's Ship) Gets approval and USS wich contains the same ammount of letters (if that means anything to them #) Gets so much opposition. To prove my point im gonna now show you a picture, Taken from the own YPPedia with its reference link and all to prove this. Now, With that up there showing this point, How does HMS appears to slide and USS Apparently dont? 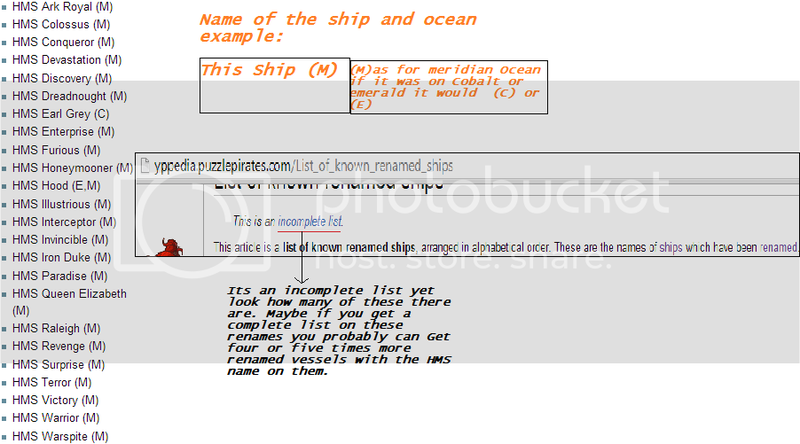 Going back to our first two images, you can clearly see where the Rules said Fammous Fictional ~OR~ Historical Vessels. Somehow Prometheus bended this rule his own way and morphed it almost completely into Famous Historical Vessel, When clearly theres a Space between the Famous [fictional] and Historical Vessels exception. Even so , after that he says something about proving it did something beyond what it was created for or something like that? Where, Dear YPP developers, Oms and other staff, Does it says that? The rule clearly doesnt so why do you add that? Its like Hidden Fees you dont know of until your rename gets denied and To me thats Bending the Rules in favor of your judgement, And i dont care if you are OM or Pirate, if there are rules, The rules are for everyone and Everything and you cannot add or substract from them just to make it fit your own criteria.And lets not Forget. You people, The OMS, use this very information when you want to let us know about what to do/or follow in regards of meeting your criteria, Yeah like when you redirected me to that link. Im gonna let you know this, and you probably do know this and probaably agree when i say if something Historical directly attached to someone or something Happens to Someone or something it doesnt matter if it is One event or one Hundred, It will still be something Historical. And putting in an example. 9/11 happened once, But just because it happened once doesnt mean it isnt historical. All these Vessels have Something historical Directly involved in them Doesnt matter how Big or small it is they are historical. You can go ahead and do some research on them. So please Take notice at this issue, Because it isnt fair HMS vessels that dont Fit the Criteria get approved and Others, That Do meet the criteria dont because someone wants to bend a bit the criteria. Or atleast re-evaluate ALL these HMS ships and undo those Who dont meet the requirements because if its fair for Some it gots to be fair For the others. PS: All those pictures have their Respective Links because i talk with evidence if anyone wants to check em out. Sorry if I missed this, but are you trying for standard or custom renames? I have used USS Galveston but I did it as a custom rename. USS Texas was taken so I used Battleship Texas as custom. Custom Vessel Rename, The historical Exception is for full Custom vessels renames. I got two USS, after i got another OM involved but yeah Alot of the other renames, Wich do meet the criteria fully do not get approval, But i keep watching how all these HMS ships are being approved. Regardless some of them meet the criteria stated by the rules or not. Edit: And how the Om morphed Famous Historical Vessel to keep holding the renames, when the rule doesnt say that , it is A) Or B) Either Famous fictional Or Historical Vessel.